Finding the best online casino to play at can be a challenge with the wide range of options available today. Video Slots Casino is one that keeps you entertained with a wide range of games, promotions and features, together with multiple currency options, many banking solutions and helpful customer support. The bright and colorful home page of Video Slots Casino draws you into the excitement of their site. The home page offers all the information you may need to have a full casino experience, with easy to access links for any other information you may need. The site is set out clearly making it simple to navigate around and pleasant to play at. Videoslots.com is powered by the leader in online casino gaming software, Microgaming. All games are played directly in your browser with no need to download or install the software. This allows you to begin playing almost immediately and the games are available for PC and Mac users. The casino offers fantastic features and functions from Microgaming with their graphics, animations and sounds being particularly impressive. A chat facility and multiple currency play are just some of the user-friendly features at the casino. While the name of the casino might suggest that they offer only slots games, this is not the case at all. Video Slots Casino offers a wide range of table games, card games, video poker, scratch cards, slots and jackpot games. Blackjack and roulette games are among the most popular, but with more than 400 games to choose from, there is sure to be something for everyone. If you have any questions when playing at Video Slots Casino you can contact their customer support team that is available to help. They can be contacted via email, telephone and instant live chat. They aim to respond to email enquiries within 12 hours. There is also a FAQ section on the website that contains the answers to many general questions. 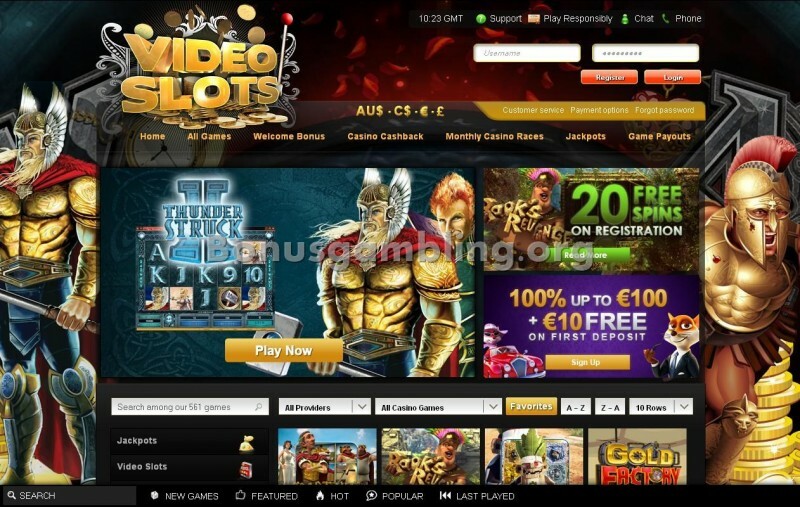 Video Slots Casino is owned by Panda Media and is licensed in Curacao. The casino does not accept players from the United States and all players must be 18 years of age or older to play at the site. Launched in 2011, Video Slots Casino offers some impressive features. I was very impressed when I visited the casino and discovered the wide range of games, promotions and customer support options available to me. The welcome bonus offers caught my eye right away as they offer €10 free cash on your first deposit, plus a 100% match deposit bonus up to €100. There are a number of other bonuses and promotions available as well for existing players. The 25% casino cash back offer keeps the bonus money flowing in and the monthly casino races give you the chance to win a share of the €1,150 prize pool each month. The welcome bonus gave my bankroll a welcome boost before I even started to play and I enjoyed the chance to take home extra cash on a monthly basis. I will certainly be back and will tell my friends all about this casino.